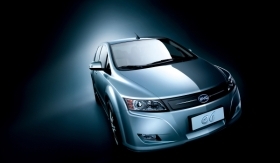 BYD plans to sell the e6 electric car in Europe. In China, a small fleet of the EV is being used by a taxi company. HAMBURG (Bloomberg) -- BYD Co. plans to start selling its electrical vehicles in Europe in the last quarter of 2012, German newspaper Euro am Sonntag said, citing Paul Lin, BYD's head of marketing. Earlier this month, BYD Chairman Wang Chuanfu told the Financial Times that BYD will export the e6 electric car and the S6DM plug-in hybrid from China to Europe by the end of 2012. BYD, which is part-owned by American billionaire Warren Buffett, displayed the cars at the Geneva auto show this month. However, the automaker's EV program has missed some deadlines. Originally BYD planned to sell its e6 in the U.S. market in 2011. The company has delayed that introduction until 2012. In China, the BYD has sold a small fleet of EVs to a taxi company in Shenzhen, the automaker's home town. But the model is a slow seller in China.